Confessions of a 40k addict: Terrain is everything - hedge your bets. Terrain is everything - hedge your bets. A quick one, another gem from the old White Dwarf back catalogues. 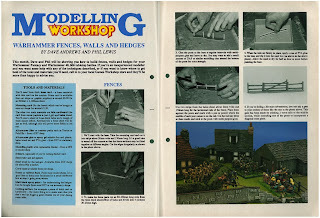 This time it's more a tutorial than tmeplates - how to make Warhammer fences, walls and hedges. Hope you enjoy it.